The first 100 pages/questionnaires are “balanced” with one of each type. This is your default section, where you get a mix of question types to create a character. As a DM, providing each player one of these pages is a nice way to handle a new campaign. The second part of the book (also 100 pages) takes the same questions and randomizes them completely. I find this helpful for generating ideas for NPCs. The third section has the same questions sorted by type in a condensed format. I like this as a way to think through a particular idea for a character, such as ideas on a good connection between my character and another PC. I can look at just the Interparty Relationships and pick one I like. Additional ways to use the book are provided, including shortcut methods for rolling to determine questions for particular needs. 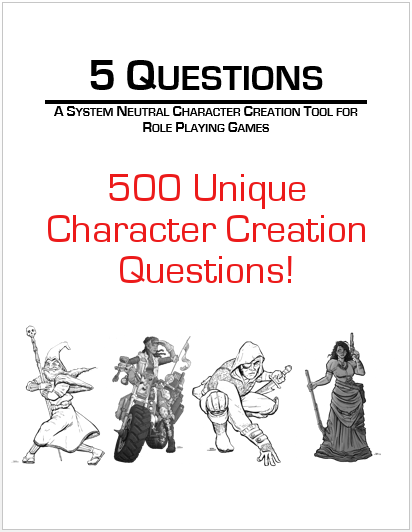 5 Questions – A System Neutral Character Creation Tool for Role Playing Games is written by Brian Benoit. Brian is a friend and one of my favorite DMs. I’m biased towards liking anything he creates, because he’s darn awesome. At the same time, I’m generally very critical of ‘game aids’. I tend to think I’m already doing fine and that they won’t be worth the price. The Verdict: If, like most people, you are eager to find new and better ways to create compelling characters, this is a steal at the price! A single great idea for a character is, to me, well worth that price alone. The value will decrease the more you feel that your characters are as robust as you need them to be. Still, I found the ideas the book provided useful and I will continue to use this in my games (and I feel very good about my character background skills). This book works well for different genres, extending its utility. The different ways the information is provided makes it fit more needs. For example, it is fun to read over the different ideas and tuck away a few for future use. Or, you can take just questions that are relationships between PCs and use just those in a game. Many of my favorite RPGs have some system to encourage backstory. I find this product works well with those systems. For example, the book can give you ideas for the background, flaw, ideal, bonds, and personality traits for a 5E character. Or, some sections could help generate your 13th Age PC’s one unique thing. 1. Why are you currently not a citizen of any nation or kingdom? As a child, Feor was sent from his homeland to the far north in order to become bonded to the Queen of Air and Darkness. Believing this to be an honorable sacrifice for the good of his family, Feor willingly chose to leave. Feor was raised and trained in isolation by Auril’s clergy, with little connection or memory of his homeland. 2. How did the king/president/supreme leader make you look like a fool? The sacrifice to the Queen of Air and Darkness was mostly a ruse to keep half-elves out of the community. The leaders believed that Auril’s clergy would have Feor killed out of hand, but his knack for the fey and arcane side allowed him to instead became a trusted servant with the elven remnants of the old church. 3. Why do you talk to animals like they’re people? Because when you can Speak with Animals at will, it is like talking to people. Stupid people, but people. Which is still much better than speaking with stupid people. 4. Who in the party was once hunting you for a bounty, and why are you now working together? There has always been a little friction between the humans worshipping Auril and the elves serving the Queen of Air and Darkness. Feor often sides with nature against civilization, even in the far north. After one of these missions hit a little too close to home, Ruslan was asked to track down Feor and bring him to justice. However, while they don’t completely see eye-to-eye, over time they realized that their motivations on behalf of either aspect of Auril were too similar for a simple bounty. 5. What potentially world-changing secret are you keeping? Feor studied ancient magics during his training, many of them held in secret since the Queen of Air of Darkness first left the Feywild. Probably one of those is important or something. The product addresses DMs, expecting a DM to push this for a campaign. Though that is useful, players might be just as large an audience. Players could use more guidance on what to do with the answers and how to expand upon them. Just two examples of how 5 questions could fully create the background for a 5E, 13th Age, or similar RPG PC would be really useful for players. I didn’t find much utility to the completely random section, but others might. I did really like the other two sections and the different ways the supplement can be used. The introductory information is useful. The product works well across any fantasy RPG. It can offer some help for a modern or future game, but it wouldn’t go far enough for that in many cases. The product’s appearance is very bare-bones. Some minor layout would have made it more appealing, even using standard word processor tools to add an attractive footer/header. This doesn’t impact function. I’m a huge fan of creating vivid characters that are entertaining for both you and the others at the table. I think that comes down to two elements. One is that they have something interesting about them. This is usually a cool hook that you want to learn more about or see expressed often. The second is a sense that the character is robust, with a good sense of all the different facets of their personality. With this second one, you ideally think of the character as a role in a movie or play – you know what they would do in different situations and you can execute that convincingly. Over the years I’ve tried various techniques to make interesting and robust characters. I’ve written before about several techniques, including using FIASCO-styled relationships in Temple of Elemental Evil, Backstory and how Dresden Files ties PCs to the campaign, and how a DM can integrate PC backstory int a campaign. This post on Backstory provides a good overview, including the use of questions to help a player learn more about their character. When it comes to questions, there is a real classic: a series of books called Central Casting, by Task Force Games. The one I have is Central Casting: Heroes of Legend, by Paul Jaquays, but they are all similar. You get a series of tables and you roll various dice to figure out your character. The book ends up covering too much, inevitably stepping over your game system (for example, it has you roll for race and some results conflict with game economies or other aspects). However, the process always turned up some great ideas. As an example, I randomly turned to a page with a table called “Apprenticeship Events”, filled with entries of interesting things that happened if you are an apprentice. Number 5 is that you find your master’s shop is a front for a vast criminal network. It can go to far, such as having you roll again and now you were involved in the crimes with a chance to be imprisoned. In practice, you are better off if you ignore results you don’t want and cut off decision trees if they start to go too far. Read More: Merric Blackman recently reviewed 5 Questions at his excellent site. I wrote my review before reading his. Thanks for the great review! I’m glad your group found it useful. You even used it in a few ways I hadn’t thought of. I’ll look at adding an NPC advice and Player advice section, and update the document for everyone that’s already bought it. So, question. Both you and Merric stated that the product would work well for fantasy campaigns, but not as well for a sci-fi, modern or other genres of RPG. Being that I tried to design the questions to be genre neutral, how could the questions have better addressed genres other than fantasy? Thanks for making it, Brian! Nice job! Most of the modern games I play have a specific focus. For example, Night’s Black Agents with a mix of spy and horror. Or, Spycraft that is very James Bond espionage. Or, Shadowrun. There I am often looking for a very genre-specific tie and these questions, while applicable, are a bit off-focus. For example, fantasy adventurers care about apprenticeships and parents. Spies tend to focus on countries, criminal organizations, spy agencies, and love affairs. I guess I felt like it was hard to really get to where I wanted. HOWEVER, that was at first glance. If I look at the example questions I posted above, those actually work fairly well for a modern or future campaign. They aren’t specific to it, but certainly aren’t problematic and can lead the player to the right further specificity. And maybe that’s something you could address in the instructions. The more specific your game world, the more you use these questions as a jumping off point and refine them. In Dark Sun, that question of a bounty might tie into the other PC’s background (maybe they are Veiled Alliance) and the question about a supreme ruler ties into specific elements about that city-state (which Dragon King, how do you deal today with Templars and how do they deal with you, etc.). Ok, I can see that. The more focused an RPG is on the genre, or the more “out there” it is (thinking Eclipse Phase), the more work a player will have to put into making the questions applicable to their character. Thanks for the great feedback. I have some good ideas now on ways to update the introduction – and luckily, with DTRPG, everyone who already purchased it gets the update too! This entry was posted on January 30, 2016 by Alphastream and tagged Backstory, Character Building, NPCs.